The Basil Bold Front Fixmounted is a stylish choice of bicycle basket designed to sit at the front of your frame. The basket has reflective details and is suitable for fixed mounting, as well as being height adjustable. 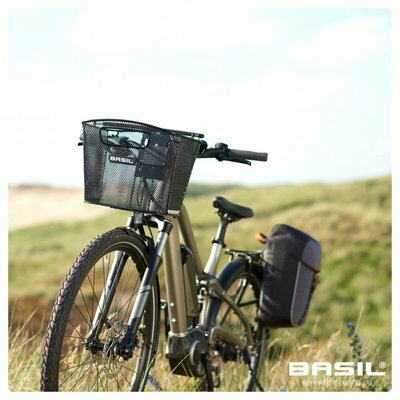 The Basil Bold Fixmounted is a practical choice of bicycle basket. Made from hard-wearing steel, this black bicycle basket is perfect for picnics, trips into the office or simply having to hand when you’re in need of extra storage. Incredibly sturdy and with a sleek black finish, this basket offers 16 litres capacity, meaning there’s plenty of space for all your essentials. It’s also easily adjusted thanks to convenient recesses. The basket is easy to mount and is suitable for all Basil Permanent System II holders and e-bikes. You can also count on better peace of mind, thanks to reflective trims enhancing your visibility in the dark. Need to keep things covered up? Use a rain cover to keep your essentials well protected in the event of a rainstorm or downpour. Browse more exciting offerings from the Basil Bold Front collection online today. Suitable for all Basil Permanent System II holders and e-bikes. Special recesses allow attachment of a rain cover or mesh. Easy to mount on your bike. Reflective logos provide enhanced visibility.